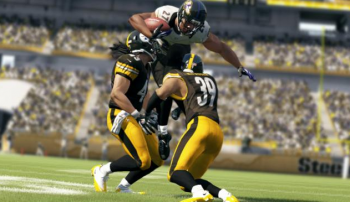 EA says its relationship with the NFL is extremely strong. EA's control over the American football simulation market was allegedly about to come to an end, but according to EA there's plenty more Madden to come. "Contrary to some reports, we still have a number of years left on our agreements there [with the NFL] and are currently in planning on the next Madden property right now," says EA CEO Andrew Wilson. When the 2012 settlement to the 2008 class action against EA was announced, EA said that it settled in order to put an end to the problem. "We look forward to continuing our partnerships with the NFL and NCAA," an EA spokesman said at the time. As part of the settlement EA had to give up its agreement with the NCAA and couldn't sign an exclusive deal with the Arena Football League for at least five years after the date of the settlement. Even if a competitor were to try to break into the market now, it'd be difficult to make headway against the Madden machine. Particularly since, as Wilson was quick to point out, "the relationship that we have with both the NFL and the NFL Players Association continues to be extremely strong." Looks as though EA intends to keep its dominant position, come hell or high water. Guys, you see, EA isn't all that bad! Just look at their heroism, fighting tooth and nail to continue bringing you your annual Madden release! Now, somebody send their CEOs to the frozen North. Maybe they will eat their NFL agreement...and other things. Unless EA starts releasing more sports games on PC, I will not be interested. I'm not particularly interested in Madden, but I'd like to give it a go. I'd really like to see a return of NHL though.